A Proper Golf Grip Will Lead To Straighter Shots! Utilizing a proper golf grip is one of the most important parts of the golf swing! A faulty grip will alter the angle of the club face at impact and result in a poor shot. Your club needs to move in unison with your body leading up to impact in order to maximize momentum and power. Much of the power that is created during the swing comes from the wrists. That is why a good golf weight training program is important, but it's also why the club needs to be placed in the proper position in your hand. An improper placement can lead to a slice or hook. Many golfers suffer from a wicked slice or hook and many times this can be corrected with education regarding the proper golf grip. 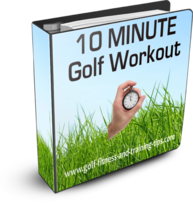 The lead hand in a right handed golfer will be the left, and vice versa for a left handed golfer. One of the most important keys to a proper grip is holding the club more with your fingers and not your palm. With the club held in front of you, and the club face square, start the grip at the base of your pinky finger. The grip of the golf club should then be aligned diagonally in your fingers, heading toward the middle section of your index finger. Gently close your fingers on the grip and place your thumb on the opposite side of the grip. To ensure a good grip, lower the club to the address position. Your thumb and index finger should form a "V", and the point of this "V" should be pointed towards your back shoulder (right shoulder for right handed, left shoulder for left handed). The lead hand is the most important of the two, as this is where the majority of the control and power will come from. The bottom hand will be the right in a right handed swing, and the left in a left handed swing. *Quick anatomy clarification: With the exception of your thumb, each finger has three sections with two joints separating the sections. Each finger connects to your palm at a larger joint called the MCP joint. 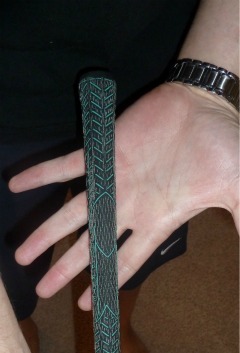 With this grip, the club will be initially be placed at the finger joint closest to the MCP joint on your ring finger. The grip will then be placed across the middle section of your middle finger, and ending at the joint closest to your finger tip on your index finger. 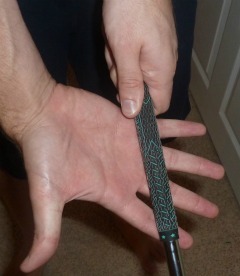 Close your bottom hand around the grip, with the base of your thumb wrapping around the thumb of your leading hand. To use an overlapping grip, the pinky finger of your bottom hand should rest between the knuckles of the index and middle finger of your leading hand. To use an interlocking grip, the pinky finger on your bottom hand rests between the knuckles of the index and middle finger of your lead hand, while the index finger of your lead hand rests between the knuckles of the pinky and ring finger of your bottom hand. The other type of grip is a baseball style grip, where there is no connection between the pinky or index fingers of either hand. Simply grip the club like you would a baseball bat! For a final check of the proper golf grip, the "V"'s made by the thumb and index fingers of each hand should be pointing towards your right shoulder. Remember, some of the most important golf swing tips involve the grip. The grip is the first step to developing a proper golf swing. Now that you are using a proper golf grip, you need to establish a proper stance. If you continue to struggle finding the proper golf grip, there are a couple of great products on the market that I highly recommend. Both of these products are traditional golf gloves, however, they have markings on them which help you place the club in the correct position in your hand. The two products are the David Leadbetter Correct Grip Glove and the SKLZ Smart Glove. If you would like to read my review of both of these gloves, please see my Golf Training Glove page.